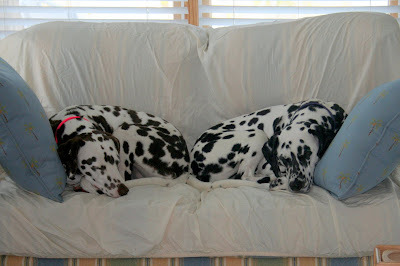 Just snapped this photo of Tess and Jazz with all their winnings from the Dalmatian Club of America's National Specialty Show. I'm still waiting for some pictures from the official photographer, but the girls are shown above with Jazz's second place qualifier in the Road Trial, Tess and Jazz's second place in Brace Obedience, Jazz's third place qualifier in Novice FAST Agility (also her NF title), Tess' first place qualifier in Rally Advanced A, Tess' second place qualifier in Excellent B Standard and fourth place in Excellent B JWW Agility, giving Tess a Double Q and her Master Excellent Jumper title. Whew! All that in three days. The girls continued their winning ways this past weekend at CPE agility. Tess had 6 qualifying runs out of 8 total, and Jazz had qualifiers in Jackpot, Snooker, and Wildcard and finished her Level 3 Strategy Games title. Since Tess earned her CPE C-ATCH at the end of last year, she and Jim have been working on their CPE Agility Team Extraordinaire title (C-ATE). It requires 20 qualifying runs in each of the seven Championship classes, plus an additional 2000 points from any classes of the handler's choosing (qualifiers earn between 15 and 25 points, depending on the class), so it's a big undertaking. Tess has probably completed half of the requirements to date, so although she isn't recording many titles these days, she's working hard towards the highest title in CPE agility...and having fun all the time! The vacation adventure of the day today was to visit the Cape Hatteras Lighthouse. Jazz and Tess at the entrance to the lighthouse. What a great photo opportunity, huh? Here's Jazz and Tess on the beach with the lighthouse in the background. The girls had a grand time at this beach and got lots of pets and attention while we were at the lighthouse. We met a young lady at the lighthouse who said she was former military and suffers from post traumatic stress disorder. She visited with Tess and Jazz and said it was very therapeutic for her. She was thrilled to hear that the girls are therapy dogs. It was so nice to put a smile on the face of this woman who served our country. Beach buddies Sammie, Tess, and Jazz on a bench at Okracoke. Tess and Jazz in the Okracoke dunes. Last week, we traveled to Ohio and Kentucky for the Dalmatian Club of America's national specialty show. The main purpose of our trip was for Jazz and me to compete in the Road Trial. Over a year ago, we started preparing and conditioning for this 12.5 mile horseback ride, and that all became a reality last Thursday. 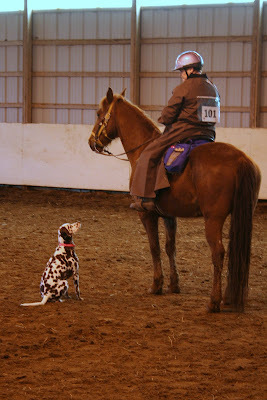 The photo above is of Jazz and Winchester, the horse we were assigned for the ride. This was during a warmup period in the indoor arena. Winchester is a lovely Tennessee Walker, so I was looking forward to a nice, smooth ride. He was a very sweet boy who was great with Jazz. 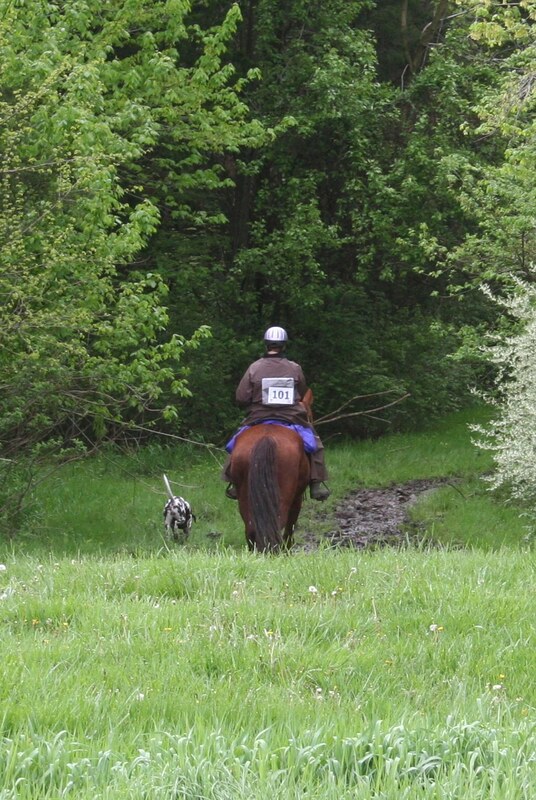 Here's me, Jazz, and Winchester heading off down the trail for our very first Road Trial. The weather on the day of the ride was fabulous, but the area had experienced a lot of rain in the previous days and weeks, and the mud was horrendous. I actually considered pulling Jazz from the trial because of the mud and a concern that she may slip and hurt herself, but another experienced rider said that she had ridden in these conditions before and the dogs always seem to pick the safest path for themselves, so I decided to see how the first part of the ride went. As it turns out, the advice I was given was absolutely correct and Jazz made her way safely through the muddy conditions. I also thought she'd be miserable in the mud, given her princess-like tendencies, but she was so happy to be out on the trail with the horse that she didn't seem to mind the mud! Here's what Jazz looked like after 3 hours and 12.5 miles!! Despite the less than perfect conditions, Jazz earned her Road Dog title with a second place finish and a very respectable score of 551. A perfect score is 600 and anything over 300 is a qualifying score. Scores over 500 count towards a Road Dog Champion title, so I was very pleased that we scored so well in our first trial under VERY muddy conditions. 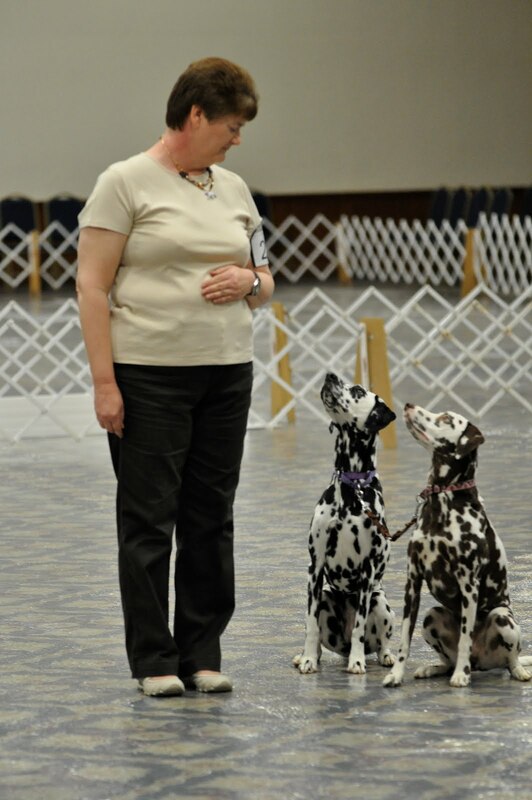 On Friday, we got all cleaned up and competed in Obedience and Rally at the host hotel in Kentucky. The first class we competed in was Obedience Brace, where Tess and Jazz are tied together with a coupler and must complete the Novice Obedience exercises (photo above). The girls had a very nice run and earned second place. Tess then had a great Rally Advanced run and qualified with first place! 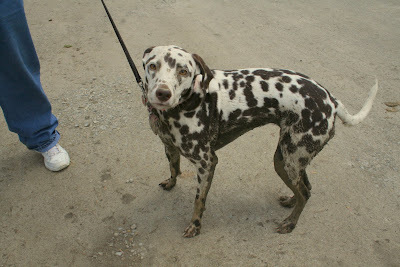 On Saturday, we headed out to Clermont County Dog Training for the DCA agility trial. The girls continued their winning ways with a third place Novice B FAST run by Jim and Jazz to earn her Novice FAST title, followed by a second place qualifier in Excellent B Standard and a fourth place qualifier in Excellent B JWW for Tess and Jim, earning another double Q and Tess's MXJ title!! Thanks to all our friends who followed the DCA results on Facebook and sent their well wishes and congratulations. We had a great time at Nationals and were able to catch up with some old friends and make some new ones, too! Immediately after agility on Saturday, we headed for a well-deserved beach vacation, so stay tuned for some photos of our adventures in the Outer Banks.